How on earth is it already nearly 2015 already?? Not only has this little holiday break flown by (I go back to work Friday), but I can hardly comprehend how it's already been a year since Trey proposed and I began the craziness of wedding planning. Each year I like to look back through my blog posts and pick out some favorite outfits. This year was a big transition year for me blog-wise because my blog photos got exponentially better (praise The Lord) and I'm finally to the place in life where I can post a lot more as of this fall. Compared to past years, some of my posts weren't as 'fun,' because this year I've really focused on adding great basics to my closet, as well as nice work wear. But I'm happy with how my style has evolved and with the direction my blog is heading! This outfit got me featured as a Lauren Conrad 'Chic of the Week' last spring, which was so so exciting for me! And, I'm still obsessed with this outfit for a night out. I loved this outfit so much that I packed it for my honeymoon. I do love to switch things up with something fun and colorful once in awhile! This was another outfit from our honeymoon and I just loved these colorful shorts! Another work look that I loved because it felt a bit edgy and because this was an unusual color for me. This is a super simple look and I would wear something like this pretty much every day if I could! You all know I love my neutrals and basics, and I know this is an outfit I'll still love 10 years from now. 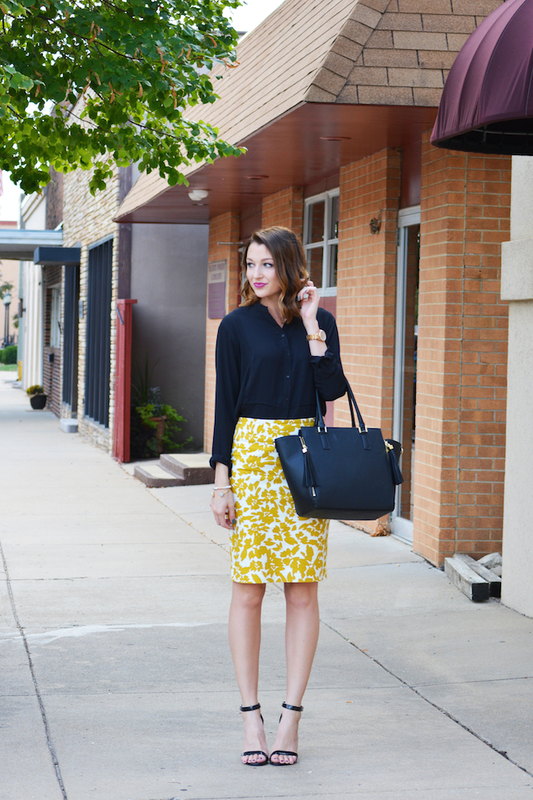 This pencil skirt was one of my favorite finds this fall (the school district I work for has black & gold as its colors, so it was perfect), and I just love the bold color! You all know how much I'm loving on hats this fall/winter season, and this was one of the first outfits I put together with one. I love this light neutral look! This is one of my go-to casual looks right now and I'm obsessed with camel right now (it's so flattering on everyone)! And last but not least, my beloved burgundy pants that make my winter work wardrobe so much cuter and add some much-needed color! Thank you all so much for reading my blog in 2014! It means the world to me, and the outpouring of love and encouragement I've received this year has been such a blessing. I'll be back tomorrow to wrap up 2014 with some personal highlights from this wonderful year.